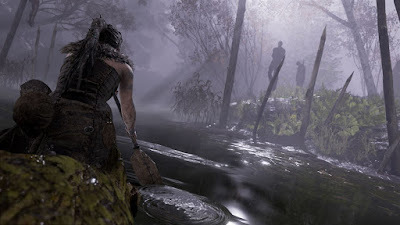 Indie games with “AAA” production values is definitely something I can get behind if they all turn out like Hellblade: Senua’s Sacrifice from Ninja Theory. It has the look of a big budget production but is still able to take risks with its storytelling to deliver an experience totally unlike you’ll find from either typical “AAA” games or indie titles. With gorgeous visuals and sound, a great story, and a stirring depiction of mental illness, Hellblade: Senua’s Sacrifice seems like a surefire winner save for one little issue – the gameplay isn’t especially fun. Depending on what you’re looking for in a game, however, that may or may not be a big deal. 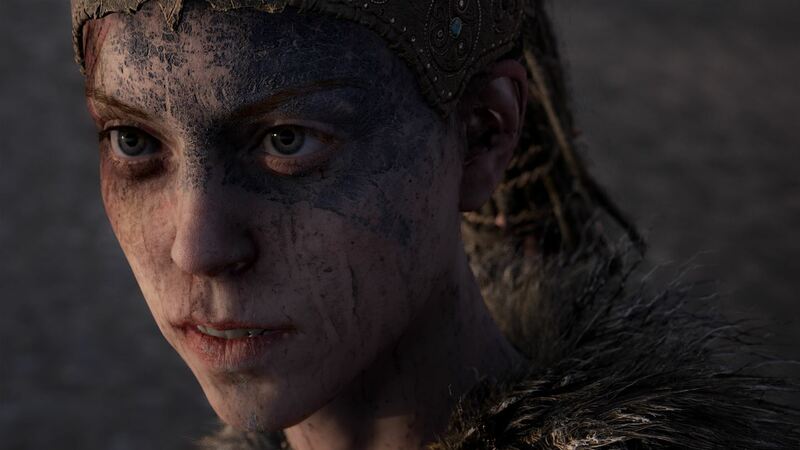 To see what I mean, continue reading our full Xbox One Hellblade: Senua’s Sacrifice review. Hellblade is the story of a Pict warrior woman fighting her way to Hellheim to rescue the soul of her lover from the goddess Hela. 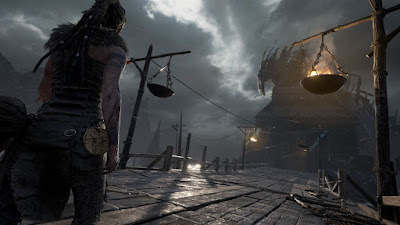 The woman, Senua, suffers from psychosis, which she and others believe to be a curse, presented as voices in her head and delusions of what she sees around her. Mental illness plays a central role in the story and has been very respectfully depicted here. Through the gameplay (more on that below) you really feel and understand the unease and fear the Senua is experiencing, which is a pretty incredible accomplishment. The gameplay takes place from an over the shoulder third person perspective as you guide Senua through Hellheim. The gameplay is essentially split into thirds – one part walking around, one part solving puzzles, and one part combat. Unfortunately, I don’t find the puzzles or the combat to be particularly fun or satisfying and they actually get in the way of the enjoyable bit, which is walking around gawking at beautiful visuals and learning about the story through narration and the voices in Senua’s head. I feel like Hellblade could have just as easily been a true walking simulator but Ninja Theory was like “Hey, we’re Ninja Theory, we need combat and stuff to do” and, thus, there was combat. I’m not really sure that was the best direction for the game, though. My problem with the combat and puzzles is that they are both really simple and repetitive. Puzzles consist of lining up symbols with objects in the environment, similar to some of the puzzles in The Witness. From the first puzzle to the last puzzle, that’s what you’re doing. You see a symbol on a door and then try to find that symbol in the environment. It’s boring and, worse, occasionally frustrating as finding what you need and getting in the right position to make it work isn’t always easy. Honestly, I don’t like the puzzles. The combat is simple and straightforward and, again, mostly boring. When you enter combat, always in larger open obvious “combat arena” areas, the camera locks onto the nearest enemy and Senua draws her sword. You have light and heavy attacks as well as a guard breaking kick, and you can dodge. Different types of enemies require slightly different tactics and you sort of just tap away until the unnervingly numerous waves of enemies are dead and you move on to the next walking and puzzle bits. My problem is that the combat encounters always drag on for several beats too long. This was intentional, of course, because of a very specific and very important story and gameplay point – if you die in combat too often, your save is wiped and you have to start the game over from the start*. Clearly, they made the combat encounters drag on for so long because they want you to feel uncomfortable and share Senua’s fear and uncertainty and dread that any lapse of concentration during combat could literally be your last. There are consequences in Hellblade, which is absolutely brilliant, but I feel like it comes at the cost of the game actually being enjoyable to play. The combat simply isn’t good enough to be fun for very long, but you get hammered with wave after wave after wave of enemies and boring puzzle after puzzle after puzzle and it just becomes a drag pretty quickly. I’m sure that there are people out there that don’t typically like walking simulators who will appreciate that Hellbalde actually gives you videogame-y stuff to do while telling a deeper story than most videogames offer. There are plenty of folks who hate walking simulators because they think they’re boring and “not real games’, so maybe Hellblade will be the narrative driven game that finally breaks through for them. That’s great. For me, though, I feel like the gameplay kind of gets in the way of the other genuinely good bits. The good news is that Hellblade’s good bits are really, really well done. The story is extremely well executed, for example, and the presentation is absolutely phenomenal. This game looks incredibly good with gorgeous environments, amazing lighting and weather effects, and Senua’s character model is one of the best looking you’ll ever see. This game looks like a tentpole “AAA” release from a huge publisher, but it is a $30 indie game, which is awesome. It sounds incredible, too, with outstanding voice acting that easily tops pretty much every other game on the market. When you start playing the game recommends using headphones for the best experience, which I highly recommend as well. The voices in Senua’s head play a huge role in the story and gameplay and wearing headphones make their whispers all the more intimate and realistic when they feel like they’re not just in Senua’s head, but bouncing around yours as well. All in all, Hellblade: Senua’s Sacrifice is absolutely brilliant in many ways, but to be honest I hate playing it. I totally understand that games don’t have to be “fun” to be great, but Hellblade’s puzzles and combat are so repetitive and boring and off-putting that I just can’t enjoy it. I also get it that Hellblade is perhaps not really meant to be an enjoyable experience considering the subject matter, but it is so heavy and overbearing and exhausting to play that I struggled with it. As you can tell, I’m really conflicted because I can see that Hellblade is good, but I just don’t really want to play it, which makes recommending it to other people tricky. If you want a graphical showcase and a unique story told in a radically different way, give Hellblade a shot. If you want a fun game, or a relaxing game, I’d skip it. With a $30 MSRP, though, it isn’t a huge investment to make even if you end up disliking it.